A year ago, on June 8, 2013, approximately 100 persons attended a Vancouver Heritage Foundation sponsored “Places That Matter” event recognizing Celtic Cannery, a former community of Japanese Canadians who once resided in the Southlands area of Vancouver. We were pleased to have in attendance a few former residents and the Consul General of Japan, Mr. and Mrs. Seiji Okada. Celtic Cannery commenced operation around 1900 and over the next four decades a thriving Japanese Canadian community developed. It was home to approximately 25 Japanese Canadian families who resided in row housing along the Fraser River. Many of the “Celtic” residents originated from Sakaiminato area of the Tottori prefecture in Japan. Although the Japanese referred to their community as Celtic Cannery, the cannery was in fact closed many years earlier when BC Packers purchased the site. A shipyard was built around 1926, however, the prominent vocation was fishing, with the Company providing housing for its employees. The fishermen, in lieu of rent were able to pay for their housing by selling their catch to BC Packers. The “cannery row” housing consisted mostly of two-bedroom rectangular bungalows and two-story houses. The houses were finished in cedar siding laid vertically and also finished with cedar shingles. 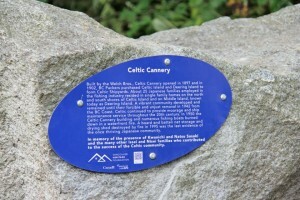 Celtic Cannery became a vibrant neighborhood in Vancouver. Two Nisei – Mariko Teraguchi (nee Ishikawa) and Seiji Kadonaga – who were born and raised in Celtic Cannery recall Celtic as a close-knit self-contained Japanese community. While most of the residents grew their own vegetable gardens, Mariko recalls her home having a large yard in which her mother grew flowers and raised chickens. Seiji recalls that each house had its own Japanese bath (ofuro). The toilets were arranged outside of the home in a series of stalls with each family having its own identified stall. One of the families, the Adachi family, had their own telephone which was accessed by the rest of the community. Within Celtic, a small confectionary store owned by the Shintanis sold groceries onsite. As well, entrepreneurs, like Mr. Hotta and Mr. Komoto would bring their mobile businesses to Celtic, selling Japanese goods and groceries. Elementary students attended Kerrisdale Elementary and older students trekked to Pt. Grey Jr. High and/or McGee High School. Students did not integrate with the wider Caucasian community and immediately after school would return home and attend Japanese school in Celtic. The Nihon gakko was financially supported by all the families in Celtic who valued their culture and language. The school also functioned as an important community centre where meetings and social gatherings took place. On Sundays, the Harry family led the community with Church activities and worship. While the families had access through their fishing boats to travel across the water to meet other Japanese friends and relatives near Steveston/Sea Island (Vancouver, Acme and Terra Nova Canneries), Celtic residents would also take the street car to the central Japanese business area on Powell Street to maintain their cultural and social ties. With the abrupt onset of the War, a dramatic disruption of the people of Celtic Cannery took place with their forced expulsion in 1942. The Japanese community would no longer exist. While for many years a dilapidated net house and maintenance structure was the prominent remnant of the Celtic Cannery site, the building was destroyed by fire in 1995. There remains little evidence of the Celtic Cannery site with the exception of the shell of the shipyard building. One year ago, with the June 2013 Vancouver Heritage Foundation (VHF) “Places that Matter” recognition of Celtic Cannery, family, friends and supporters of Celtic Cannery successfully obtained approval from the Vancouver Heritage Foundation and City of Vancouver to honour the people of Celtic Cannery with the construction of a Japanese garden in which the VHF plaque could be placed. A modest Japanese garden located at the corner of Celtic Ave and Blenheim St. has been recently completed. The garden has been undertaken through the support of the Vancouver Japanese Gardeners’ Association. Special acknowledgement goes to Mr. Yas Kato, the owner of Earth Sculptors who provided the landscape design and coordinated the project implementation. Special thanks to Agri-Saki Consulting Inc. and owner Harvey Sasaki who provided sponsorship for the VHF plaque. As well, we are grateful to all the families, friends and supporters of Celtic Cannery who generously supported this garden project. Family and friends were honoured to meet a few former residents at the VHF presentation: Seiji Kadonaga, Mariko Teraguchi (Ishikawa), Tom Endo, Yoshiko Sasaki (Adachi), Joe Komori and Amy Tokai (Miki). Supporters of Celtic Cannery dedicate this garden to all the issei and nisei who, through their strength and perseverance, have paved the way for succeeding generations. (Initials represent head of household/eldest son) Apologies for any errors made in this area. M. Miki, Y. Shintani, Z. Yoshihara, R. Kadonaga, K. Adachi, S. Endo, S. Kadonaga, Y. Oseki , R. Adachi, S. Nakumura, T. Omotani, T. Endo, I. Yamamoto, Y. Nagata, T. Ishikawa, T. Uyeda , K. Endo, T. Yasuda, I. Yamamoto, E. Yamamoto, S. Watanabe (teacher). Deering Island residents – (T. Kano, Y. Yamashita, M. Shintani and the Marumoto family). Celtic residents who owned property: (K. Sasaki, A. Ito and Y. Minamimaye).